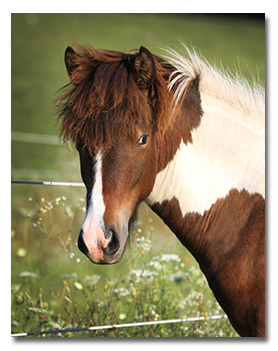 Loftsteinn is a striking bay pinto gelding. But his special color is just an added bonus to a very charming, beautiful, and talented young horse. The sky really is the limit for this exciting gelding. Loftsteinn comes from generations of very well-known and proven bloodlines on both sides of his pedigree. Lofsteinn’s sire is our own first prize, Hergill frá Oddhóli. Hergill’s sire is the great Logi frá SkarðI, who received first prize for the quality of his offspring. Logi’s sire is none other than the great honor prize stallion, Hrafn frá Holtsmúla. Hergill’s dam is the great breeding mare Hekla frá Oddhóli who has produced four first prize horses – including Hergill. Loftsteinn’s dam is our first prize, Gima frá Ytra-Dalsgerði. Gima herself comes from a long line of honor prize stallions such as Stígur frá Kjartansstöðum, Náttfari frá Ytra-DalsgerðI, and Kjarval frá Sauðárkróki. These genetics have produced many great riding horses. In the fall of 2013, Loftsteinn received an official young horse evaluation from FEIF International Breeding Judge and US Breeding Leader Barbara Frische with an outstanding result – becoming the highest scored young horse in North American for 2013. Barbara found him to be very well-developed, with a very long well-raised neck, sloping shoulders, good length of croup, cylindrical body, light build, long and correct legs, and excellent hooves. In movement he displayed lots of high quality tolt with a super range of speed and high and wide movements. In fact, she believes tolt will probably be Loftsteinn’s strongest gait. His walk, trot, and canter were also very good – and there is the possibility that he may have flying pace as well. Barbara was also impressed by his character, finding him attentive, cooperative, and brave with good reactions. Barbara's overall opinion was that Loftsteinn is a very good horse. We are happy to announce that due to his stellar young horse evaluation Loftsteinn is the 2013 Studbook award winner for the highest evaluated young horse in North America! Out of a pool of approximately 60 young horses, this is quite an accomplishment for a young foal. Though our original plan was to keep Loftsteinn as an intact breeding stallion, we adore him so much that we really wanted him as a full time riding horse - so he has been gelded. We believe he will be a superb riding gelding and we are very excited to watch him develop. To view many more photos of Loftsteinn as he grows please visit his photo album. For more information on Loftsteinn please contact us.